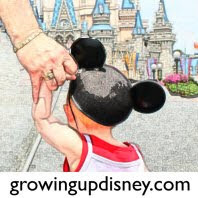 Growing Up Disney: A Walk Around The World With Ridge-- Happy Halloween! A Walk Around The World With Ridge-- Happy Halloween! OK, so I know it's not Halloween yet but that isn't stopping Disney from throwing a party until it is. Mickey's Not So Scary Halloween Party, or MNSSHP as it is noted most everywhere to save energy, is a special event open only to guests who purchase a separate ticket to stay in the park after hours and Trick or Treat. There are candy buckets set up around the park near the open attractions. Don't be afraid to load up on the candy especially when it starts getting near the end of the evening. Don't be bashful, wear your costume, it's encouraged. There are special HalloWishes fireworks at 9:30 and Mickey's Boo to you Parade runs twice during the night. I have less than a month (22 days but who's counting) before my trip and I haven't decided if I want to go this year or not. It certainly is fun and the night time fireworks and picture opportunities are many. Here is just one of the many decorations that infest the park for the party. When it's time for the parade the Headless Horseman kicks things off. It's a real talent to hold one's head and ride a horse. Once the parade begins all of your favorite characters make an appearance. Even Mickey and the gang dress up for the party! Everyone loves Wendy, Peter & the Lost Boys and they can cut a rug! Wave goodbye kids, it's off to Neverland! Why, following Peter as always is Captain Hook and Mr. Smee. But what to my wondering eyes did appear, it's Tick Tock! Always right behind Hook, he had a taste O' honey and now wants the whole bee hive... Peter loves that story ask him to tell it. Things take a turn for the spooky when the caretaker comes along with his not so emaciated dog... due to PETA and good taste they let this one eat more often than the one in the Haunted Mansion. A crowd favorite has to be the dancing somber butlers, complete with shovels looking to add that one extra guest to the Haunted Mansion. They really undertake pride in their work. Things really liven up when the ballroom ghosts step it up. Gus. Ezra and Phineas are bringing up the rear. They will jump out at you, "look out!" Just kidding, it was just a little fancy photography. The last major float is for the Villains. The parade comes to an end when Goofy and his Candy Co, crew bring in a little much needed advertising that yes Virgina, we do have candy... for sale. Last year Amy and I were fortunate enough to go to the MNSSHP with tickets generously given to us by our friends at Travel With The Magic. We still thank you so much for helping us with our trip and continuing to help with our travel needs.